Hangzhou, the capital city of China’s Zhejiang Province – a growing e-commerce hub on the country’s eastern coast – is set to host the 2016 G20 Summit, and is preparing with a series of infrastructure projects. The Hangzhou Grand Theatre (HZGT) was awarded approximately 7.5 million Yuan (about £790,000) to upgrade its stage lighting system, 11 years after the theatre opened with an ETC lighting system. ETC’s Chinese dealer, Hangzhou YiDaShi Lighting Equipment Co. Ltd. (YiDaShi), supplied the theatre with ETC’s latest innovations, including Source Four® LED Series 2 Lustr® luminaires, Eos Ti® and Gio® lighting control consoles, and a Sensor® power control system. The 55,000 square metre HZGT is made up of five venues: the 1,600 seat Opera House; a 600 seat Concert Hall; a 400 seat Multifunction Hall, an open air stage; and a 700 seat Cultural Square. As an international performing arts venue that stages world-class productions, HGZT wanted to upgrade its traditional lighting rigs to a state-of-the-art colour-mixing LED lighting system. “The application of LED technology is now a global trend in modern theatre,” says Zhong GuoMiao, a senior engineer and director of HZGT’s Stage department. They researched many LED fixtures from a variety of manufacturers worldwide, and found that ETC’s LED luminaires are the perfect fit for the venue’s specifications. 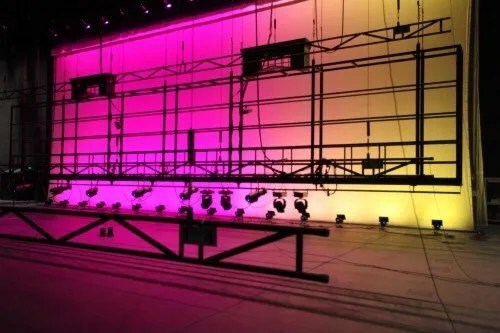 All of HZGT’s 14 Sensor dimming racks have been upgraded to the new generation of CEM3, which has improved connectivity. Additionally, the theatre has been equipped with 60 more relay modules, which optimise the ratio of dimming and relay from 12:1 to 4:1, to allow for broader use of intelligent fixtures. The lighting control system in the Opera House has also been replaced with an ETC Eos Ti, backed by the compact yet powerful Gio. Eos family consoles are dedicated and powerful tools for controlling LED fixtures, making control of intelligent fixtures convenient and user friendly. Multiple ETC Net3 Gateways have also been purchased for full ACN-networked functionality. And an ETC Unison® architectural control system with a variety of control stations and interfaces regulates the houselights and worklights in the facility. After nearly six months of renovation, the reopening of HZGT was 25 December 2015, beginning with a series of programmes featuring traditional Chinese and classic Western music.